Te Ahi Kaa, ‘the Hearth Place’, is a Catholic Young Adult community living in the Palmerston North Diocese. Bishop Peter Cullinane, along with Mary-Grace and Johnny Williams, opened Te Ahi Kaa in 2012. Mary-Grace and Johnny led the community for the first three years; in 2015 and 2016 Mieke and Maurice Davies were the Te Ahi Kaa co-ordinators; and from 2017, I alongside Tausilia McClutchie have led the community. Every year, four community members are invited to spend a year living in community with us in Te Ahi Kaa under our house pillars of ‘formation, service, prayer, and hospitality’. Together, our journey is one of growth and discussion. 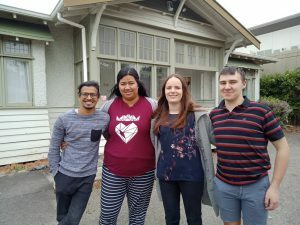 This experience provides a platform for members to share their gifts with others, to connect with other Catholic young adults, and it serves as a welcoming community for other young Catholics in Palmerston North. Members of our Te Ahi Kaa community are encouraged to get involved with a vast range of Catholic faith-based activities ‒ involvement with Masses, youth groups, retreats, prayer, and other community service. On Sundays we run weekly events from Te Ahi Kaa for the wider Young Adult community; and we also hold discussion nights, prayer, games, movie nights, and pub nights. We are now seeking expressions of interest for Te Ahi Kaa for 2019. If you or someone you know who is aged 19–35 and will be living in Palmerston North next year, please invite them to consider living at Te Ahi Kaa! We are looking for people interested in exploring their faith in conjunction with their work or study commitments in a supportive, caring and welcoming environment. Please contact: Georgia on 021811148 or [email protected] for more details and an information pack. Georgia Collins is a Te Ahi Kaa Co-ordinator for the Diocese of Palmerston North.